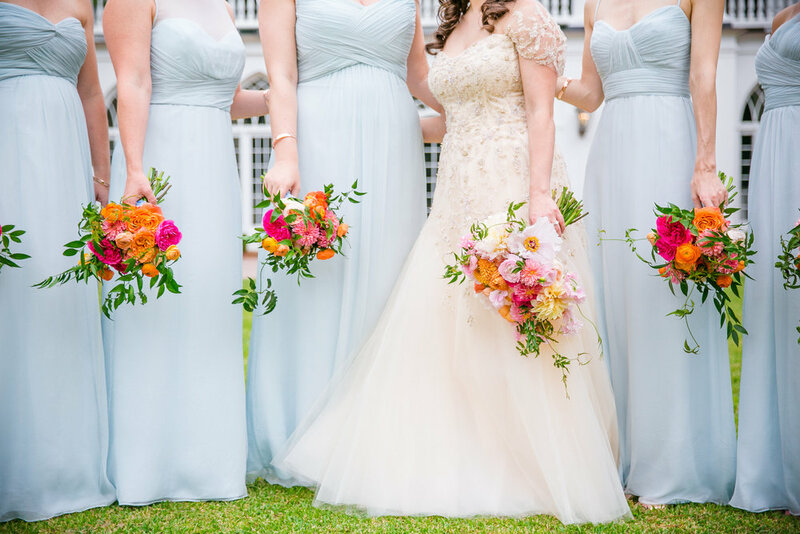 Kiera + Brian's Lowndes Grove Plantation wedding was an elegant day to remember! The day began with hair and makeup for Kiera and her bridesmaids in the Lowndes Grove Suite, while Brian and his groomsmen got ready at the French Quarter Inn. Both of these stunning locations made the perfect backdrop for getting ready photos. It's so special to capture the hours leading up to the ceremony! Kiera + Brian opted out of a first look and said "I do" at Saint Luke's Chapel. Kiera looked classic in a beautifully beaded Monique Lhuillier gown. 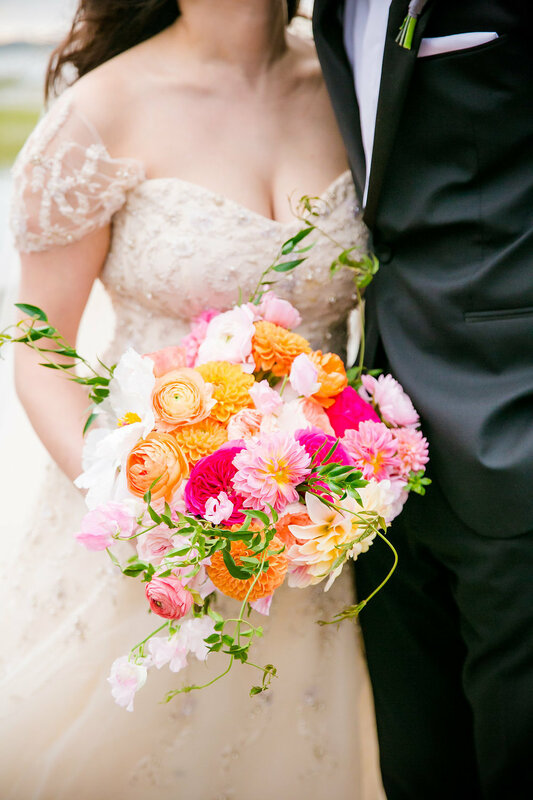 As Kiera walked down the aisle to her handsome groom, she carried a spilling, textural bouquet of peach juliet garden roses, pink maria teresa garden roses, peach tree peonies, cafe au last dahlias, coral peach ranunculus, and more lush blooms. When Brian saw Kiera for the first time, he couldn't contain his excitement. The two said their vows with Brian's father as the officiant. As the newlyweds happily exited, guests made their way to Lowndes Grove Plantation for the reception! The tent was beautifully decorated with long ivory linened tables, mahogany chivari chairs, vintage China, majestic light blue napkins, and gorgeous pops of orange, coral pink, and pink ranunculus in thin clear glass bud vases. The cake was a beautiful shade of light blue with textured detail and vibrant pink maria teresa garden roses and majolica spray roses. The couple had specialty engraved cake forks that read "I do" and "Me too". Extra details we loved were the bride's custom Instagram signs with rose gold frames and place cards attached to vintage keys that doubled as bottle openers! Guests were treated to a plated dinner and a night of lively dancing to the sounds of Stephen Darby. Before the reception came to a close, Kiera + Brian departed under a sparkler archway into their vintage Rolls Royce getaway car. 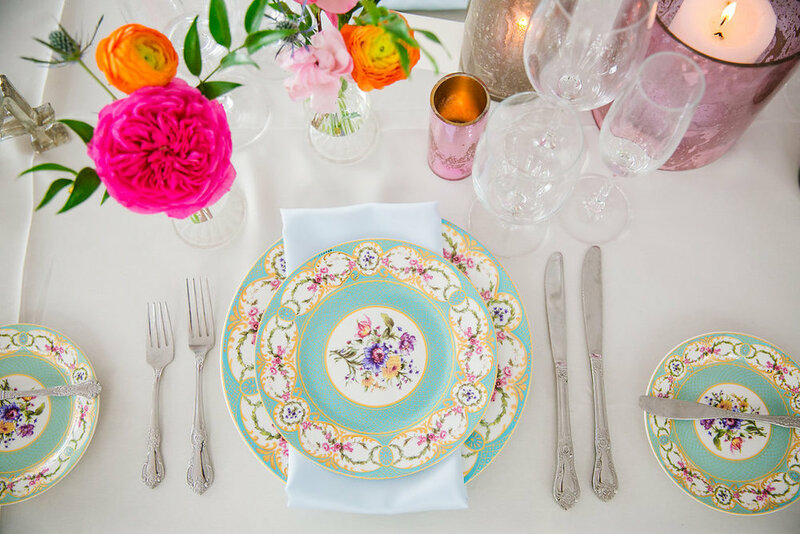 We adored this elegant, vintage design with shades of light blue and pops of vibrant blooms. Wishing this New York couple years of happiness to come!